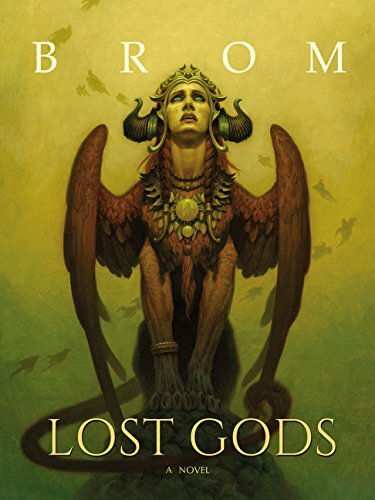 Fantasy author and artist Brom has continued his trend of rewriting myths and legends with the recently released Lost Gods. While his previous books explored the myth of Krampus and the tale of Peter Pan, his latest work dives deep into the underworld and a pantheon of gods and goddesses, angels and demons. Brom’s charm as an author has never been in his ability to spin beautiful prose or three-dimensional characters. His strength has always been in crafting a well-paced tale full of conflict, twists, and turns. Lost Gods does not fail to disappoint in that area, with an early uppercut to the reader’s jaw that sees the main protagonist dead in the first act and fighting to retrieve a magical key from the underworld. Chet Moran is a very sympathetic protagonist, and the fate of his girlfriend and unborn child hinges on the success of his quest. Brom creates tension that carries the reader to the end, despite a few plot points that end quite anti-climatically, with solutions that seem convenient and too tidy. For example, there is one significant antagonist introduced briefly as a vital character who is killed off-screen. There is no lead-up to his disappearance from the book, simply a random battle where he essentially escapes. A few scenes later, and he’s just dead and replaced with a more threatening antagonist with no lead-up. The transition was jarring, and the author missed a chance to develop the character arc of the existing villain, make his death more significant, and build tension toward the climax. Brom’s worldbuilding is commendable in this book; however, Lost Gods deals with complex concepts and themes that he does not handle with enough respect or skill. Religion, or lack thereof, plays a huge role in the identity of so many readers, and Lost Gods is unfortunately tone-deaf to that sensitivity. The result is an outrageously offensive narrative where babies who die without being baptized go to purgatory and one of the main antagonists is an army of men who don’t have allegiance to any God. In other words, the bad guys are atheists. The insensitivity of those plot points, combined with a few cringe-worthy scenes, make Lost Gods a problematic book. For example, when Chet goes to purgatory, he meets a young man named Jimmy, a quadriplegic who committed suicide. Jimmy claims that by killing himself, he released his mother from her burden of him and delights in his own death, which has made him young and able-bodied. Jimmy is killed again in Purgatory in the most random and casual manner, and his soul, or ba, floats away from his spirit flesh and is tortured forever in a cloud of pain and misery. These clouds of souls, who are obviously in pain, are never explained or resolved. Jimmy is essentially a disabled throwaway character who is mentioned only once after his death and never mourned or given closure. Using religion as a plot device and death itself as a worldbuilding foundation demands a certain level of cultural sensitivity that isn’t addressed in Lost Gods at all. The author leaves out Jesus and Mohammed from the cast of the novel, choosing to put them in the background as “The One Gods” who are too powerful to dwell in Purgatory, most likely to avoid offense. It isn’t enough. Conversely, Brom’s work is not meant to be deep social commentary on religion and the afterlife, or award winning literature. It is written to be fluffy, fun fantasy. Readers who can ignore their own feelings about religion, lack of religion, death or ableism would probably enjoy the story woven as is. Those looking for deeper meaning might find themselves at a loss.